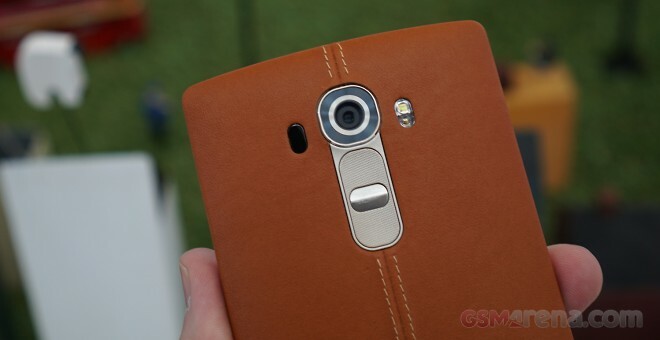 Today we saw the unveiling of the LG G4 and we even got a chance to play with it first hand. What we also saw on display was the full suite of accessories, which will be available for styling the LG’s flagship. And no, it’s not just the leather backs. Indeed, the available accessories will include a handful of premium back covers, but there are also Quick Circle cases and the official premium LG QuadBeat 3 headset. We start with some of the available color versions of the leather back of the device. LG hasn’t yet disclosed if those will be available separately but given that the front of the device is always black and they are easily removable we will be shocked if they aren’t. The leather back features high-quality genuine leather that feels really nice to touch and certainly gives a premium look to the device if in more subdue way (as opposed to the more flashy glass on the Samsung Galaxy S6). The regular plastic version isn’t actually very regular as it has a unique finish of its own – the ceramic coating applied and what LG calls “hammered pattern” really make the phone easy to recognize in the crowd. They don’t feel as premium as the leather backs but they should make up for that with lower pricing. The first actual accessory is the CrystalGuard case – a very slim transparent protective case that really adds a very minimal amount of bulk. It does some damage in terms of looks, though. Next we move to the Quick Circle cases – LG has been releasing those for its phones for a while now and the G4 is naturally no exception. The company has designed a special UI for the case which gets activated when the cover is put on and lets you control you music player, answer calls, snooze alarms, among others. Finally the QuadBeat 3 headphones will be part of the retail package of the G4 in some markets. Those not as lucky will be able to purchase them separately as a relatively inexpensive way to boost the sonic experience on their G4s.